To purchase the report, create an account or log in now. 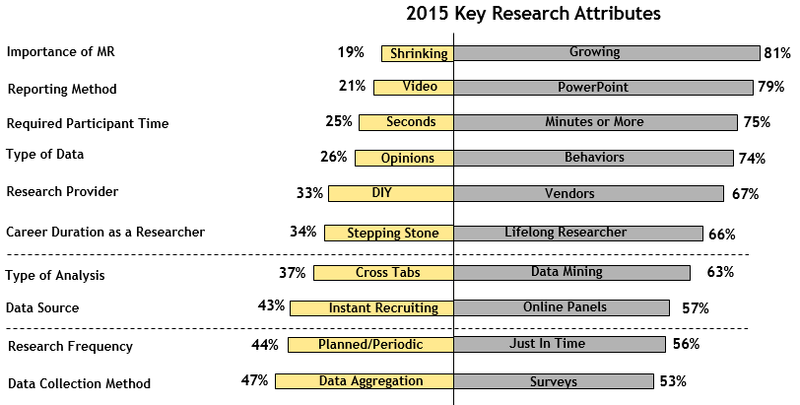 More than ever, the Market Research Industry is experiencing change. Industry consolidation. New technology. Challenging and uncertain economic times. The need to do more with less. 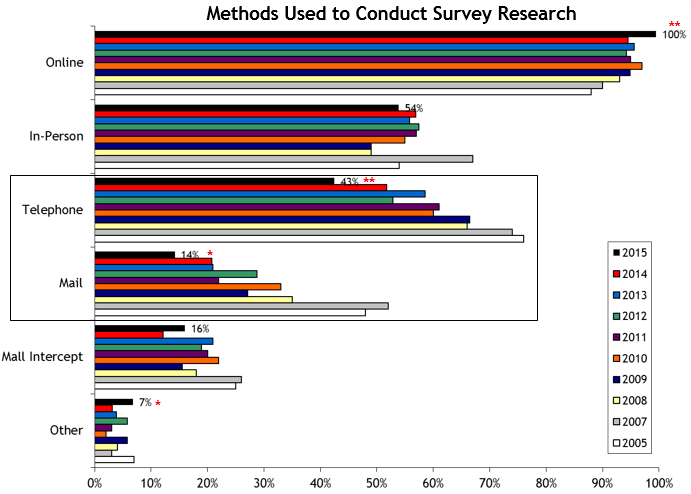 The 2015 Annual Survey of Market Research Professionals is based upon the attitudes and opinions of 675 Market research professionals. Each invited participant completed our online survey between January 12 and February 1, 2015. The aggregate results have a data tolerance of +/- 3.8% at the 95% confidence level and include many questions from the 2014, 2013, 2012, 2011, 2010, 2009, 2008, 2007 and 2005 research initiatives -- providing an invaluable longitudinal perspective. This new in-depth, 71 page report is available for $499. To purchase, open an employer account, select "Pricing Plans" and choose the "2015 Annual Survey of Market Research Professionals." The report will be emailed to you within 30 minutes after your purchase. Despite most MR professionals citing they are overworked and being required to "do more with less," employee job satisfaction increased by five percentage points in the last year. While the "typical" market research professional currently earns $105,488 with average salaries increasing by 2.1% during the past year. Fortunately bonuses have surged by 32% to help drive morale and encourage employee retention. For additional compensation information revealing the impact of experience level, role, industry, and geographic location, please see the detailed report. 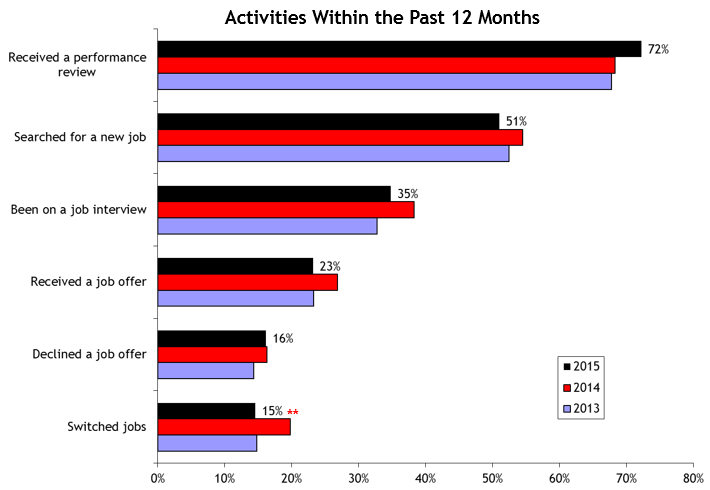 During 2015 a greater number of researchers received a performance review -- perhaps increasing comfort levels and helping to explain why fewer MR professionals have searched for a new position, been on an interview, received a job offer or actually switched jobs. Online surveys have finally reached full penetration with 100% of MR Buyers using this method while telephone and mail surveys continue their annual decline. In the next five years, researchers believe the importance of MR will continue to grow, be communicated through traditional written reports, require a longer time commitment from participants and rely upon consumer behaviors (vs. opinions). Below is a Table of Contents for the 2015 Edition of the Report.